paper 1-885941-29-3 American readers who know Robinson only through his nine Inspector Banks novels (Blood at the Root, 1997, etc.) are in for a treat. 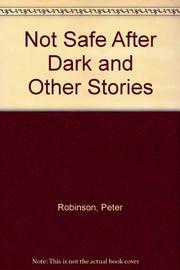 Robinson’s first collection includes not only three workmanlike Banks stories (including “Summer Rain,” in which a visitor from America asks Banks to solve the murder of his previous incarnation) but a Florida private-eye story, two sharply observed historicals, and seven tales exploring the various relations between victimhood and guilt. An inoffensive conventioneer in Los Angeles turns into a maddened executioner; a mystery author obligingly supplies a fan with a recipe for the perfect real-life murder; a man who quixotically braves a city park finds out just why such places aren’t safe after dark. Though not every story rises to the inspiration of “The Wrong Hands” or “The Two Ladies of Rose Cottage,” the finish throughout is faultless. The bibliography lists two non-Banks thrillers that have never been published in the US. If this collection is a foretaste, Caedmon’s Song and No Cure for Love would make an appealing entree.